On a night when Barcelona’s Lionel Messi humiliated Manchester United’s David de Gea, a perfectly timed advert rubbed salt in the Spaniard’s wounds. The Blaugrana won 3-0 at Camp Nou in a Champions League quarter-final second leg against the Red Devils on Tuesday, progressing to the semi-finals of the competition 4-0 on aggregate. Messi helped himself to a double before the 20-minute mark and Philippe Coutinho rounded off the scoring in the second half, on a night to forget for Ole Gunnar Solskjaer’s side. De Gea was completely to blame for the Argentine’s second goal, allowing his tame shot from outside the box to creep under his arms and into the net.
? We’re in the semis!
? Don’t miss the best action from #BarçaMUFC, including goals from Messi and Coutinho. ?? 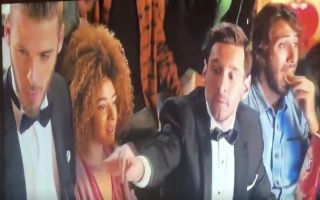 Ironically, Messi & De Gea recently starred in a ‘Lays’ advert which took on a hilarious new meaning when it was broadcast during the half-time interval, as the Barca star is seen stealing a crisp from the United shot-stopper. A few laughs at De Gea’s expense were surely had in the wake of the short clip, which you can watch below, via Twitter.